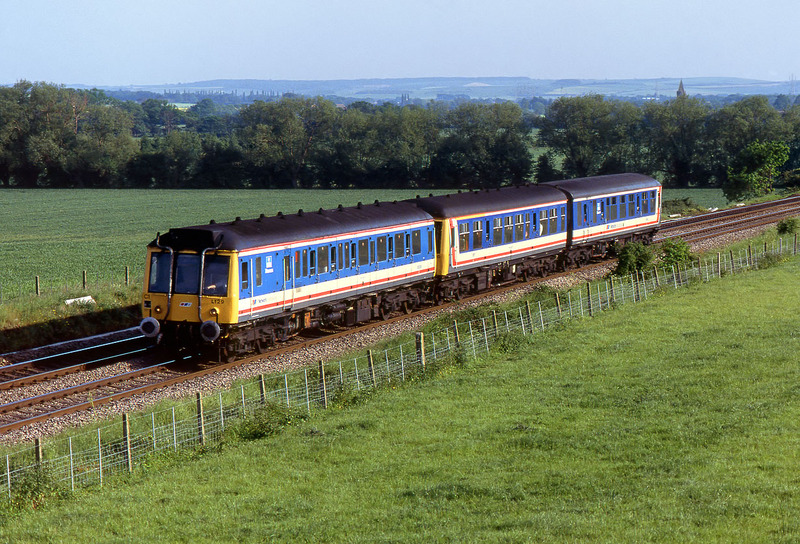 During the 1980s, the DMUs that worked the Thames Valley local services were the same Class 101, 117, 119 & 121s that had been in use since steam days, with only the occasional substitution, usually using a Class 121 in place of one vehicle from a three car set. However, when the Class 165s started appearing in 1992, all kinds of odd combinations of first generation units could be seen, as they eked out their last days. Here is a Class 121, 108 & 104 combination, pictured approaching Culham on 26 May 1992 with the 2C64 17:21 Reading to Oxford Network SouthEast service. Class 121 55029 (L129) is leading set L730 (Class 108 51571 & Class 104 53455). Note the different versions of Network SouthEast livery on the two units.